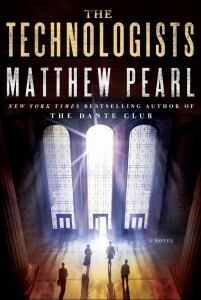 Novelist Matthew Pearl will be speaking at an event where he will discuss two of his books, including "The Technologists" -- a mystery novel centered around ingenious MIT students at the time of the Institute's founding. This is a Library event, which we are announcing because of its interest to MIT alums. Mr. Pearl writes to tell us that: " 'The Technologists' is a historical novel about the first class at MIT--the class of 1868. In the story of my book, a small clique of these first students must band together to stop a technological threat to Boston." "I am not an MIT affiliate or alum, but like many people around the world MIT always fascinated me and when I sat down to write my fourth novel this felt like the perfect topic. MIT has been very supportive, and the launch event for the novel [was] at the MIT Museum. I am also being interviewed for an upcoming issue of Technology Review." Mr. Pearl's book has been celebrated by MIT, and there is an enthusiastic write-up on the MIT Web site's "Slice of MIT". More information and a book "trailer" can be found at: www.techthriller.com and on Mr. Pearl's Web site: www.matthewpearl.com." (book cover image courtesy of MIT).